Two years ago Mario Götze was the darling of Germany. His beautifully taken extra-time winner in Rio delivered the World Cup to Joachim Löw’s team and ensured the forward’s place in the hearts of the millions watching at home. But as the nation jumped to its feet in the 113th minute, knocking over plates and spilling drinks, another German forward would have been experiencing mixed emotions – elation, without a doubt, but with a melancholic tinge. For Mario Gómez, the tournament was the epitome of a season of false starts. Despite scoring 75 goals in 115 appearances for Bayern Munich over three seasons, Gómez left the club in July 2013 after falling behind Mario Mandzukic in the pecking order – a result of the Croatian’s stellar form since signing from Wolfsburg and Gómez’s own injuries and subsequent delayed start to the season. Mandzukic hit the ground running and there was simply no getting him out of the team. In the end, Gómez signed off with a brace in the DFB Cup Final to help beat former club VfB Stuttgart and made an eye-catching move to Fiorentina for around €20m. Swapping Bavaria for Tuscany was supposed to give his career a fresh start – or at least a second wind. A new league, a new country and one of the most beautiful cities in Europe offered the ideal conditions to prosper, in theory. Unfortunately though, the reality was all too harsh. Injury and ensuing loss of form meant his career for La Viola never really got going. He scored seven goals in 29 appearances and over two seasons, which tells its own story. Last summer Fiorentina decided to loan him to Beskitas. Despite an increasing number of star names (albeit many on the wrong side of 30) turning out for clubs in the Turkish Süper Lig, the move appeared to be a step down. However, an injury-free Gómez banged in 26 goals to not only secure the golden boot but also bring Besiktas their first league title in seven years. His season in Turkey, despite reservations about the quality of the league, is evidence that, if fit, Gómez will score goals – lots of goals. His international record, though, should really make for more impressive reading. In a decade when Germany have relied heavily on Miroslav Klose, Gómez should have made a bigger impact. After a poor Euro 2008, where he not only failed to score but seemed to make a habit of missing sitters, Gómez couldn’t buy a goal – enduring a 15-game dry spell before breaking the seal against the UAE a year later. Following that, he remained a constant in the national setup. And although he often operated firmly in Miroslav Klose’s shadow, his influence peaked around Euro 2012, with five goals in qualifying and three in the tournament itself – making him joint top scorer with Fernando Torres. Still, fate reared its ugly head once more and before Gómez could get his feet under the table in Löw’s starting XI, injury curtailed his progress and he was left watching from the sidelines for both club and country. His time in Florence may as well have been spent on the moon as he became increasingly absent from discussions about the national team, first failing to prove his fitness for the Brazil 2014 squad and then failing to force his way back into the conversation even when fit, with Löw preferring more flexible players such as Thomas Müller, Götze and Marco Reus, often playing without a classic centre-forward. In fact, Gómez had to wait until the end of 2015 before being recalled by Löw and his goal against England earlier this year was his first for Germany in four years. But this time he aims to keep the shirt. His exploits in the Süper Lig have made it impossible for Löw to ignore him. The Germany coach still prefers a more fluid approach but, with Klose retired, Gómez is the only traditional No9 in the squad and thereby a viable option. Whereas Gómez’ star is rising after his productive season in Turkey, Götze’s hasn’t twinkled too often since he put a fourth star on Germany’s shirts. 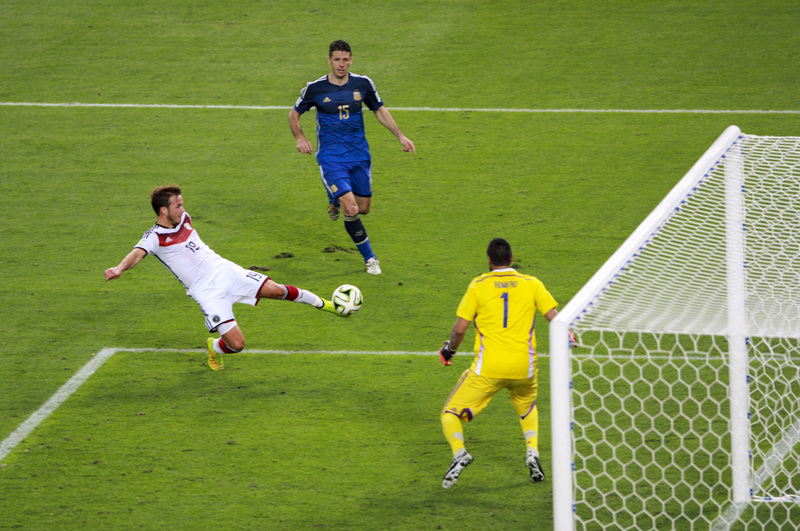 It is hard to top scoring the winner in a World Cup final, but once the open-topped bus had been parked in the garage, the bread and butter of the Bundesliga season returned and his heroics in Rio counted for little. To say that Götze was not Pep Guardiola’s top priority at Bayern Munich is an understatement. Despite being immensely talented and seemingly a player who fits Guardiola’s style, Götze spent the majority of the Catalan’s three-year tenure hovering around the fringes of the first team, flitting in and out – so much so that he has been frequently linked with a move away, principally to join his former coach, Jürgen Klopp, at Anfield. For a player with such talent, Götze has spent far too much time snuggling up in oversize Adidas coats on the bench, thanks either to niggling injuries or doubts about whether he fits into Bayern’s system. His biggest strength is also his biggest weakness; the adaptability to either play as a false nine, No10 or in a more classic attacking midfield role means he is an option for several roles but not really nailed on for any of them. This issue is no different in the national set up, and is maybe even accentuated as Germany are well stocked with creative forwards. Götze is often used from the bench by Löw and you cannot help but think that both player and coach would rather he had forced his way into the starting formation on a more regular basis two years after his greatest achievement. With Reus unable to prove his fitness and left at home, Götze’s chances of regular game time have increased, but we are still waiting to see him really take off and make his mark on games consistently. He may well set the tournament on fire. He has shown, particularly at Dortmund, and in fits and bursts at Bayern, that he is capable of pulling the strings, but the chief playmaker role is generally occupied by Mesut Özil and you need look no further than Thomas Müller for the floating forward position. It remains to be seen if and how Löw shoehorns him into the team. When it comes to Gómez, the decision is more black and white – either he’ll be played as a striker or he’ll come on as an impact sub. While Götze’s malleability makes him an attractive component of Löw’s squad, Gómez provides a very round peg for the striker’s hole, should one appear – and this gives him an excellent chance of being the more decisive of the two Marios this time around.